The tables were packed, the music was booming, the alcohol was flowing and the crowd was jovial. But this wasn’t a bar, and it wasn’t a night out, either. 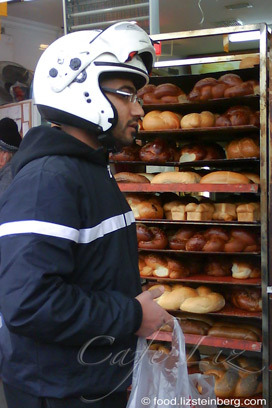 Nope — it was just another Friday morning at the Salouf Bakery in the Hatikva Market. 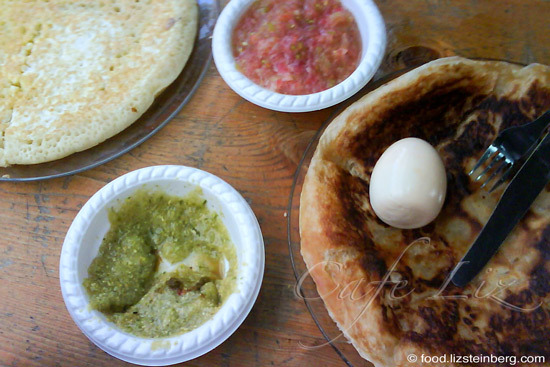 Perched on barstools, we were seated for a breakfast of Yemenite flatbreads — malawach, lachoch with fried egg, and (how could we not?) salouf dipped into frothy hilbe and hummus. The first time we ate there, Aharon, the proprietor, had plied us with drinks, including shot after shot of ouzo — apparently he couldn’t see my big pregnant belly under the table. A word about his competitors in the Yemenite Quarter on the other side of Tel Aviv? Nope, he wouldn’t hear of it. The beleaguered Hatikva neighborhood is on the wrong side of the tracks — or more precisely, the Ayalon Highway. While this is part of the Tel Aviv municipality, it certainly feels like it’s part of another city — one without the coffee shops that spatter the better off, central neighborhoods. For decades, this much-maligned part of town was known as the home of disadvantaged minority groups, and had a reputation for being dangerous. In fact, some people still may be afraid to go there. 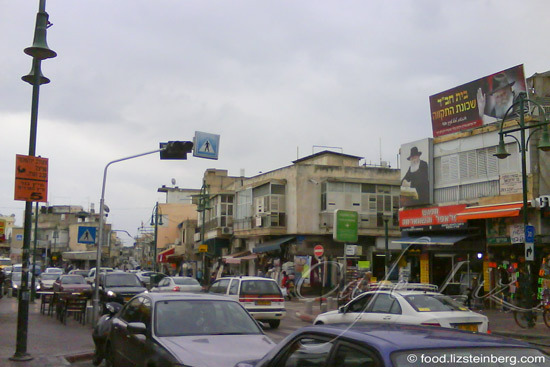 But the only real danger in Hatikva is to your waistline, because this is a neighborhood packed with fabulous, down-to-earth restaurants. You’ll find a delightful mix of Iraqi, Yemenite and other delicacies, including fried and baked sambusak, delicately stuffed kubbeh dumplings of every shade, the noodle-filled drink falooda on every corner, and enough amba — a mango-fenugreek sauce — to fill a swimming pool. What more? 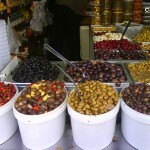 You’ll also find bakeries offering fresh pitas, Yemenite breads and challah, dried-goods stores, an assortment of coffee roasters, including one that sells the spicy Yemenite white coffee, and spice shops. And amulets. Because everyone needs some. From there, I like to continue down through the market before turning left between the vegetable stands into the narrow side streets. Pass the butcher shops and look left, and you’ll find all sorts of gems — there’s Maadanei Ofer and Maadanei Amiga, two of the more popular delis, with vats of amba sitting out front (Nuriel 8 and 10, photos above and below). Turn in the other direction and you’re in kubbeh central — restaurant â€«David Habib offers a menu full of kubbeh soups and grilled meat (Hamevaser 19, on the corner of Nuriel), while on the other side of the narrow alley, a glass case full of various stuffed delicacies tempts you — massive kubbeh with boiled bulgar shells, kubbeh with rice shells, kubbeh with potato shells and the traditional fried kubbeh. 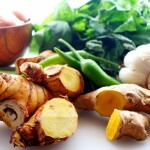 Buy to go, or sit in the folding chairs out front, where amba-flavored pickles are served alongside your meal. 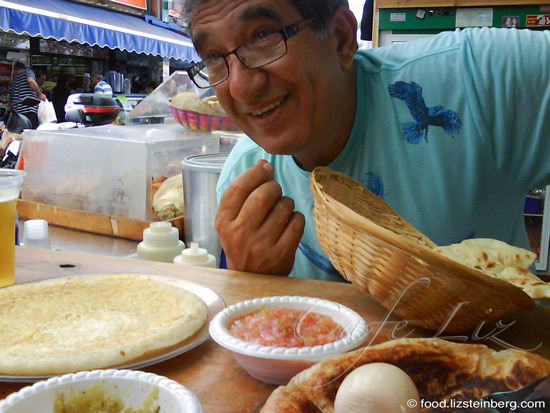 Vegetarians can order the massive fried sambusak, which are filled with chickpeas. 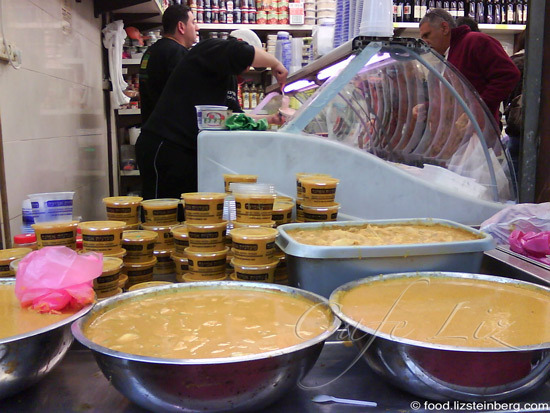 And speaking of sambusak — head a little further down Nuriel, leaving the market behind, and at the dead end you’ll find the Bukharan Bakery (Hanoch 52), which offers a variety of lighter, baked sambusak stuffed with mangold, pumpkin or spiced meat. You may not see the little shopfront at first — it’s generally hidden by the crowd of people leaning on the tiny counter. From there, I like heading left back toward Etzel Street, the main thoroughfare. 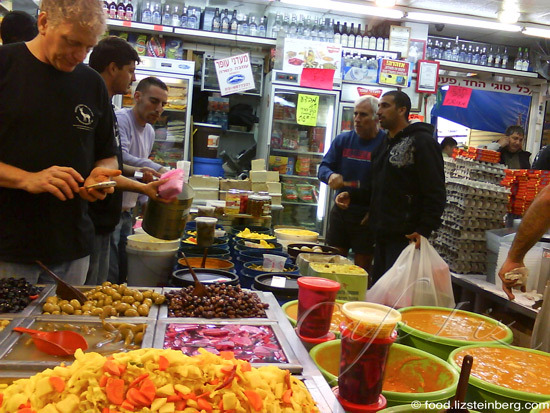 On the way are a bunch of spice stands and juice stands along Hanoch offering things like pomegranate juice year-round and the neighborhood’s ubiquitous falooda, a Persian rosewater-flavored drink full of cooked vermicelli noodles. 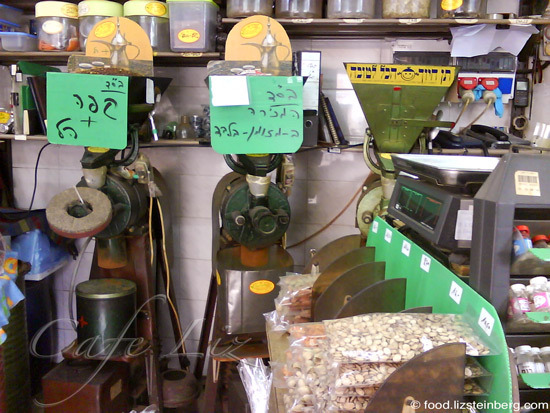 On Etzel, I head right, walking past countless restaurants until I come to Ben Yosef Spices (Etzel 73) (photo at left, and below). 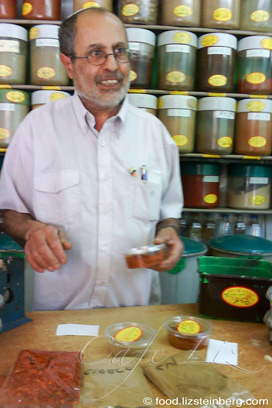 There you can buy some of the best coffee I’ve ever had, along with traditional Yemenite white coffee — a spicy, ground mixture that contains barely roasted coffee beans, which lets the powder keep its tawny color. The place also features a lovely skhug-flavored spice mix, which we received as a gift when making a particularly large purchase. From there it’s back up Etzel Street. I enjoy stopping by Cafe Levy (Haetzel 34), another coffee roaster. By then I’ve already bought my coffee, but that store has other fun finds — nestled in the back is a wall full of incense and amulets, offering a full selection of ways to ward off the evil eye. Or so I presume — I’m no expert in these things. You’ll also find a comprehensive selection of herbs including mastic, rosebuds and basil seeds, prepackaged into little bags. If it’s a weekday, from there you can continue up Etzel and stop at Israel Mercaz Hakubbeh (Vatik 1). This tiny restaurant off of Etzel has maybe four tables and an equally limited menu — massive yellow kubbeh made from a boiled bulgar shell and filled with seasoned meat, stuffed intestine, and one other stew when I was there last. But that’s enough — these are the foods that draw the customers. And where from there? By then I’m loaded down with bags and too full to eat any more. So I hop onto a sherut or bus to return to my side of town, until the next visit. More: My last post on Hatikva, from a few years ago. 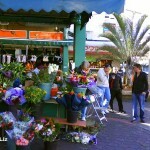 6 Responses to "Hatikva Market, the best party in town"
Thanks, Alina! This area doesn’t see many tourists, but it’s definitely worth a visit.